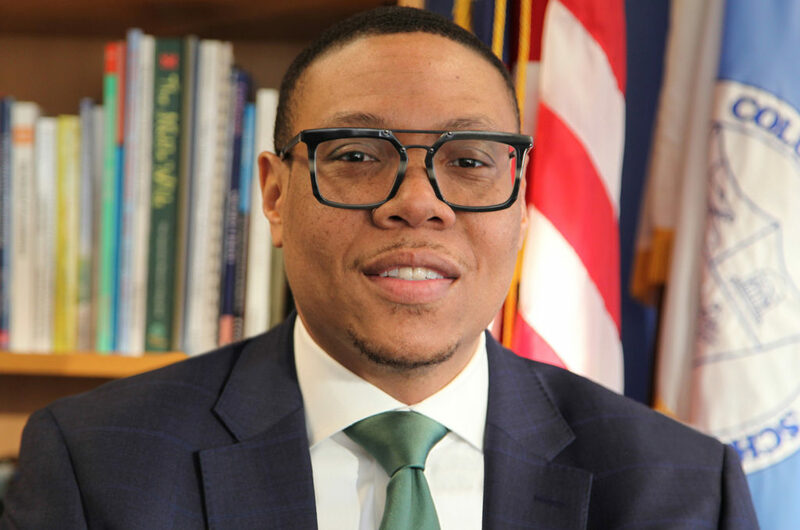 Dr. Lewis D. Ferebee, the former Indianapolis Public Schools superintendent, is the mayor’s pick to lead D.C. public schools, a system that in recent years has been plagued by scandals — including one that cost the last chancellor his job. So, who is Ferebee? And what history and vision will he bring to the District? We’ll hear from the new acting chancellor along with WAMU’s Jenny Abamu. KOJO NNAMDIWelcome back. Lewis Ferebee awaits confirmation as chancellor of DC Public Schools, a system that has been plagued by scandals in recent years, including one that cost the last chancellor his job. So, what can Ferebee, a former Indianapolis school superintendent, do for DC's 49,000 public school students? Joining me in studio is Jenny Abamu. She's WAMU's education reporter. Jenny, thank you very much. JENNY ABAMUThanks for having me. NNAMDIJen will be handling quite a few of the questions in this segment (laugh). And also with us is Dr. Lewis D. Ferebee, acting chancellor of DC Public Schools. Lewis Ferebee, thank you for joining us. LEWIS FEREBEEThank you, Kojo. Thank you for having me. NNAMDIAnd I might say good luck to you. You'll need it, if you see what has gone on in this town before you came here. But speaking of before you came here, we knew that you were the superintendent in Indianapolis. We knew that, I think, you started your teaching career in Virginia. NNAMDIAnd then you went on to North Carolina, Greensboro, then Durham. But if there is one thing that you would say describes your approach, describes your philosophy, if you will, about education, what would that thing be? FEREBEEI would say, for me, I've just learned the many experiences that, you know, to improve student outcomes, it requires a collective responsibility and approach. We have to have everybody working together to help our young people succeed. That's our educators in the classroom. That's our faith-based community. That's our business community. It's everybody. You know, there's an old adage, it takes a village to raise a child. I mean, that is so true, and I have found that in many of my experiences. FEREBEESo, I think part of my role will be ensuring that I am the champion for building that coalition of support for our young people, not only just in our classrooms, but across all eight wards, in all of our communities. So, that's the way I see my work, that's what I've learned, and I think that's the philosophy I live by. NNAMDIWhat would you say was your greatest accomplishment in the school system in Indianapolis? FEREBEEI believe that we have dramatically improved outcomes in such a way that we will improve social mobility. You know, I shared last night with the council, Indianapolis was, you know, 48 out of 50 largest urban areas as it relates to social mobility. So, basically, in Indianapolis, you're more likely to stay in poverty if you're born in poverty than most urban cities. And we knew that having the ability to graduate with credentials to go to work or go to college was critical to improving that outcome, and we were able to do that. And I'm confident that we have more young people that are working and taking care of their families and taking a step up as we think about social mobility. FEREBEEAbout three weeks, and getting close to a month now. NNAMDIWhat, during this relatively short period of time, have you learned and observed about DC Public Schools? FEREBEEWell, there's a lot I've learned in three weeks-plus. You know, I think the theme that I've talked about a lot is this call for transparency. You know, there is this lack of understanding on many issues, whether it's, you know, how enrollment processes are implemented, whether it's how schools are funded. You know, families seem to not have all the information they think they should have. There's a need to build a sense of trust, and I think that goes hand-in-hand with transparency. FEREBEEThe other is, there's a call for stability. You know, there's been, you know, several people who've been in the chancellor seat. We have teacher turnover that's has been a challenge, school leader turnover. And there seems to be, you know, a widespread concern around continuity in the DCPS community. So, that's something that I look forward to addressing as chancellor to ensure that, you know, there's greater confidence in stability. And I'll close with, you know, the need to have a high-quality school in every community, at every grade level. NNAMDIWell, before Jenny intervenes and takes over the conversation (laugh), one more from me. Have you yet met with the leaders of the Washington Teachers Union? Because you have probably known that there has been a pretty strained and contentious relationship between the teachers union and the school chancellors over the last decade or so. FEREBEEYep, yep, which is -- the IMPACT evaluation system has been an area of concern for them, and has been for me, as well. And so I look forward to starting those conversations sooner rather than later, and addressing that particular issue. ABAMUNow, I'm hearing some of the things that you're saying. You want to work collectively with people. You want to build stability, but your past record, you've built a reputation as a reformer because of things that you've done in the past. And part of that reputation is -- did shake up the system, did cause instability. And also, you mentioned last night that there were schools where teachers had to reapply for their jobs, and many of them weren't hired back again. And so how do you reconcile your past record with what you want to do here? FEREBEESo, let me be clear that, you know, when we consolidated schools, teachers were still interested in staying in a district. They had a job in the district, so I don't want to characterize that as something, that we pushed teachers out of their district. But we had some significant financial issues that required us to think about, you know, better utilizing our space and consolidating some of our schools. And I think when you are in a financial strain, you have a responsibility to respond. And, you know, we had some difficulties for a number of years as we experienced significant reductions and funding for our schools. FEREBEESo, a lot of my work has been responsive to challenges. And, you know, as I think about the district of Columbia, I expect to be as responsive and will be as responsive to some of our challenges that families have already talked about, such as technology in our schools or, you know, the stability issue that I've just referenced. So, you know, I would say, you know, I don't consider myself to be, you know, a reformer, if you will. I consider myself to be one that's responsive to the needs and the challenges that are in the community that I'm serving. ABAMUI mean, your reputation -- I know you said this last night, too, and you said that you didn't want to consider yourself a reformer, but that is the reputation that you've built. Why are you shying away from it now? FEREBEEBecause I think that, you know, in some ways, that implies that I'm a guy for change for the sake of change. You know, it's just like, let me come in and shake it up, because I'm a reformer. That's not who I am. Who I am is one who is responsive to our needs. And when you do that, sometimes that requires you to go outside the status quo, and I'm not afraid to do that. FEREBEESo, I do want the community to understand that I am not afraid to make bold decisions. I am not afraid to be aggressive about improvement outcomes. But I'm not going to do that just for the sake of change. And I think that needs to be clear to our stakeholders. And they should feel confident that if a change -- and change will occur, if you're evolving, as we should -- that it's not going to be, you know, Lewis Ferebee's trying to be a reformer. He's making change, so that he can make a reputation for himself as someone who is, you know, transformational. That's just not who I am. NNAMDIOur guest is Lewis Ferebee. He's acting chancellor of DC Public Schools. The council will soon be voting on his nomination to be the permanent chancellor. Here is Shakira, in Washington, DC. Shakira, you're on the air. Go ahead, please. NNAMDI(overlapping) The IMPACT evaluation system? NNAMDI(overlapping) So, what would be your specific question for this acting chancellor? SHAKIRAWhat is his plan to specifically address this, in requiring the District to disclose information about teachers exiting and the high teacher turnover rate, and their plan to keep qualified educators of color in the classroom for our students? FEREBEEGood afternoon, Shakira. Thank you for your service as a DCPS employee. And I look forward to hopefully meeting you soon, in one of our schools. So, what I heard in your question and in your commentary is the need around professional development, and to ensure that, in many cases, that can be customized to the needs of our teachers. And so my commitment has been to have conversations with the Washington Teachers Union about how we can ensure that our system of performance management is rooted in development and coaching and support for our teachers, as we hold them accountable. FEREBEEI am committed to a fair evaluation system, and I am also very much interested in collaborating with the Washington Teachers Union on how we can assure that it is, you know, perceived to be the fairest system possible, as we think about how our teachers are evaluated. NNAMDIWell, the Washington Teachers Union and our caller seem greatly interested in transparency, wanting to make sure they understand exactly what is going on. They felt that under the IMPACT system, that was not always clear. Have you any ideas -- as yet, at this point -- about how you intend to provide that transparency? ABAMU(overlapping) A lot of times, teachers -- I've done a few stories on this in the past, and they've talked about not knowing exactly how many teachers are retained by the system. DCPS often puts out a figure where they say they retain over 90 percent of their high-achieving teachers, but they don't talk about the rest of the teachers and how -- or if a teacher went from being high performing to lower performing one year, and then they got let go that year, for one reason or another. So, a lot of it, it does have to do around the whole stats of the entire teaching force. FEREBEEYeah, I'm comfortable, you know, having conversation and reporting on, you know, teacher turnover. I heard that statistic and, you know, the Washington Teachers Union doesn't like for us to tout that statistic. So, you know, we'll stay away from that for now. And I think what I hear, ultimately, in the argument about that is, we are touting some of our successes, and we're not talking about some of our challenges. FEREBEEAnd I think that goes back to what I was referencing earlier around transparency, is I think sometimes, you know, you can be attacked for transparency when you're painting a picture that's too rosy. And I think we have to be balanced in talking about our successes, but also our challenges. And, you know, if we have, you know, significant turnover for other groups of teachers, we need to talk about that. And we need to ensure that we're fair and transparent with that data point, as well. NNAMDIYou're a former teacher and principal with a record of turning around low-performing schools. You've garnered both praise and criticism in Indianapolis for creating a network of schools that appear to be like hybrids of traditional public schools and charters. What was the idea there, and how exactly did that work? FEREBEESo, one model for the innovation schools was just to ensure that there were greater governance over schools that were taken over by the State Board of Education and given the charters to operate. But there's another aspect of that model that I haven't had a chance to talk about a lot, and that is, you know, we did have innovation schools that were operated by nonprofits. Not necessarily charters, but nonprofit organizations. And that model actually is in the District of Columbia, as well, and that model is being implemented at Duke Ellington School for the Arts. FEREBEESo, Duke Ellington is operated by a nonprofit. It is a situation where the employees there are not DCPS employees. And that's a similar model that you would see in an innovation school, as well. So, I think it's important for the community to understand that that particular aspect of innovation school would not be unique to DCPS. I'm not saying that we need more of those schools, but I also think it's important for people to know that model already exists here in the city. ABAMUDo you think we need more of those? FEREBEEYou know, I don't know. You know, it's too early for me, you know, to say, at this point. I do know that, you know, the Duke Ellington model is, you know, highly regarded by many. And from my understanding, it has served students and staff well. I will tell you that, typically, my experience with being in cities, that the arts community is different. They like to have their own space to do what they do. And, you know, it's interesting that an innovation school in Indianapolis is a school for the arts, for that very same reason. They like to have that flexibility. FEREBEESo, whether or not we need more of those options, that's to be determined, but I do think it's important for the community to understand that that is a feature that's already here in the District, so that wouldn't be something that would be new. NNAMDIGot to take a short break. A lot of people want to talk to you. If you have called, stay on the line. We will get to your calls. I'm Kojo Nnamdi. NNAMDIWelcome back. Our guest is Lewis D. Ferebee. He's acting chancellor of DC Public Schools. Also joining us in studio is Jenny Abamu. She is WAMU's education reporter. Allow me to go directly to the phones to Carmen, in Washington, DC. Carmen, you're on the air. Go ahead, please. CARMENHello. Thanks for taking my call. Dr. Ferebee, in the labor world, you are known as a union buster. CARMENHow are you -- (laugh) yes, sir, you are. It's in many of the laborer magazines and papers. My question to you is, how do you plan to assist WT members who are retaliated against in the schools for being union members? FEREBEESo, again, I don't consider myself a union buster. And I've said this on many occasions, that -- now, want to be clear, that we are not going to run an adult employment agency. And so we do have an obligation to students to ensure that they're getting a quality education. So, if, you know, my record has been, you know, ensuring that we keep students first, I'm comfortable with that. You know, I don't think we can allow adult politics to get in the way of the work that needs to happen for our students and our families. FEREBEENow, will I collaborate with the teacher union, will I collaborate with our teachers to improve working conditions, compensation, all the above? Absolutely. And my record is really clear on that, particularly around teacher compensation and teacher leadership, which I believe is critical to improving student performance. But I also think it's important to understand and recognize that we have to keep our students first in all that we do. NNAMDIWhat do you think is the basis of the allegation that you are a union buster? FEREBEEI think that, you know, there may be some, you know, misunderstandings that, you know, when, you know, you have practices that may lead to less teachers in the District that are unionized, that you are, you know, somewhat of a union buster. I think when you, you know, create systems, in some cases, where you don't always, you know, agree to everything that's being proposed by the teachers union, you could also consider to be a union buster. But I feel that my relationship has been strong with the teachers union in Indianapolis and other teacher groups in North Carolina where I've worked. And we have had regular meetings. FEREBEEYou know, I met with the teachers union on a monthly basis, and it was an opportunity for us to talk about our opportunities and our challenges. I've committed to do that here, as well, to have regular conversations. But there are other labor groups, as well. And I talk with our principal group as well, our support staff labor group, as well. So, I know we talk a lot about teachers, but there are many other staff members that are supporting our schools on a daily basis. I don't want to lose sight of them, as well. But at the end of the day, you know, if me keeping students first, you know, gets me that tag, so be it, but we have to ensure that students are the center of what we do. ABAMUSo, I'm really curious. You talked about this a little bit last night. The outcomes for students underneath your tenure in Indianapolis, now, you noted that you cannot compare over time because the tests have changed, etcetera. But what I did see was that Stanford CREDO, they did a research study on your district in Indianapolis over the time while you were there, and they benchmarked the growth for students against the state's test for growth for students, so that you were able to compare. ABAMUAnd what the outcomes were were interesting, particularly given that, you know, you kind of closed the achievement gap between black and Latino students. And students in charter schools did pretty well, as far as growth. They showed significant growth in different places. But students in traditional public schools did not. And they actually showed significant losses in some instances, particularly black and Hispanic students. And you're in charge of traditional public schools, here. How do you reconcile that? FEREBEE(overlapping) Okay. So, for example, there is, you know, a significant special education population in Indianapolis public schools, as is compared to the charter sector. So, one in five students, 20 percent of our student population has a special education need and has IEP. You wouldn't find that in most charter schools in Indianapolis. So, I'm just giving that one example. ABAMU(overlapping) So, what you're saying is because you had a different student group, you struggled to kind of help them achieve at the same levels. FEREBEECorrect. The student populations were different. NNAMDIThis one should be pretty simple to answer, even though the last school's chancellor got into a lot of trouble over it. We got a Tweet from theridleyrams, where will his children go to school? You have a son of high school age. FEREBEEYeah, I do have a high-school-aged son, and, you know, I think, like everybody else, you know, I have committed to, you know, follow the same enrollment practices and policies. And, in fact, it's so important to me and the mayor to get that right. It is a part of, you know, my contract. And it will be something that, you know, will be transparent, but I also will protect the confidentiality of my son, as well, because my son is still my son, and I want to protect him. But we'll definitely do that the right way, and I'll participate in enrollment just like everybody else. And I think that's a commitment that should be really clear, and it is clear. NNAMDIHere is Delabian Rice-Thurston in Washington, DC. Delabian, you're on the air. Go ahead, please. DELABIAN RICE-THURSTONHello. Thank you so much. Chancellor, I have wanted for ages to tell chancellors not to be trapped by the black-white achievement gap, which poisons our city's ability to show academic progress. And I say that because everything I've studied says that parents are the primary reason that a child does what he does in school. The District of Columbia has the smartest white public school students of any state, ten points over New Jersey and Massachusetts in the United States, on the National Assessment of Educational Progress. Thirty-five percent of white parents have a Bachelor's Degree, 45 percent have an advanced degree. For black students, it's 40 percent or less who have even a Bachelor's Degree. DELABIAN RICE-THURSTONYou can help students do better, salute the fact that they are doing better, but not wind up with, oh, but we still have this achievement gap. Yes, we have it, and we will continue to have it, just because that's our population. I would also like for you to reconsider what we used to have as really high quality targeted high school accelerated or advanced programs in each of our high schools. The Wilson International Studies, the Coolidge Teaching Professions, the Dunbar pre-engineering program, the Blue Mass science technology. RICE-THURSTON...parents that sense that there was something really good in their neighborhood school and we got good quality students from those programs. FEREBEEWell said. I mean, I don't think there's much I need to add to that, which is why it's interesting, you know, I just go pushed on the data points. You know, I think if we -- we could spend a lot of time talking about, you know, why students perform in the way that they do, but I think we need to have more conversation around how do we help our students furthest away from opportunity get a fair access to the best education possible to prepare them for college and career. FEREBEEYeah, so, thank you for your comments. NNAMDIBack in Indianapolis, your handling of a 2016 sexual abuse case involving a teacher and a student has come under scrutiny. And I understand that you are a defendant in three civil suits. Can you tell us what happened, in this case? How did you respond when you were alerted about a possible intimate relationship between a 17-year-old male student and a female teacher? FEREBEEYeah, so, I want to be clear, so your question states that, you know, I am under scrutiny for handling, and I want to be clear what's being litigated is wrongful termination. And so, it is, you know, individuals who were held accountable for their actions related to the case, don't believe they should be. So, let's clarify that. And so not me handling the incident is what's being litigated right now. FEREBEEAnd I also want to be extremely clear that I take very seriously, very seriously, any accusation, any allegation of abuse and neglect. And when those allegations are made, I have responded with ensuring that our policies and procedures are followed. And I will continue here in the District. And so that's pretty much what I'll say about that. I don't want to get in too many details, as that's still being litigated. But families should know that I am committed to protecting our students. As a DCPS father, I am committed to ensuring that all of our campuses are safe and students are protected from abuse and neglect. So, that is what the community should know. NNAMDIRachel Tweets, lots of talk about unions. How about students being prepared for the world, financial literacy, basic coding principles, critical thinking and communication skills? These are the skills that will most help with mobility. How will these be incorporated? FEREBEEMm-hmm. Yeah, so I think it's important to ensure that we understand clearly from our parents and the community what learning models are important to them. I heard a lot about dual language. That's one that comes to mind that I think about. Heard a lot of interest in STEM education. So, ensuring that those areas of interest are embedded in the instructional day is something that I'm very much interested in having more conversation with our school communities about. But I think it's important that we don't just push those efforts on our schools, that it's something that there's, you know, clear buy-in and ownership from school leaders and their staff and the community as it relates to those areas of interest. FEREBEEI am excited about the potential to ensure that there are streams of learning models that follow students from elementary, middle and high. So, whether it's dual language, whether it's a focus on STEM or whether it's a focus on, you know, IB, we have very high-performance IB programs in the District. Families should see and have access to those options from elementary, middle grades into high school, and then see a clear trajectory of those offerings. NNAMDIWell, you've talked about the importance of connecting what students learn in school to real career opportunities. And before I ask what would that look like in the average DC high school, since we're out of time, I guess we'll have to just wait and see what happens. NNAMDI(overlapping) You have ten seconds. FEREBEE...having employers engaged is critical, ensuring that there's a guarantee of a job for our students when they graduate. NNAMDILewis Ferebee is acting chancellor of DC Public Schools. Thank you for joining us. Good luck to you. FEREBEEThank you for having me. I appreciate it. NNAMDIJenny Abamu is WAMU's education reporter. Jenny, always a pleasure. ABAMUThank you for having me. NNAMDIOur conversation with Lewis Ferebee was produced by Julie Depenbrock, and our update on Maryland's highway expansions was produced by Mark Gunnery. Coming up tomorrow, what are Washingtonians looking for in a romantic partner? We look at how and why matchmaking became a popular option for local singles. Of course, tomorrow is Valentine's Day. It all starts at noon. Until then, thank you for listening. I'm Kojo Nnamdi.